This is one of four paintings of Van Gogh of sunflowers dating from August and September 1888. Van Gogh intended to decorate Gauguin's room with these paintings in the so-called Yellow House that he rented in Arles in the South of France. Van Gogh and Gauguin worked there together between October and December 1888. The dying flowers are built up with thick brushstrokes (impasto). The impasto evokes the texture of the seed-heads. Van Gogh produced a replica of this painting in January 1889, and perhaps another one later in the year. 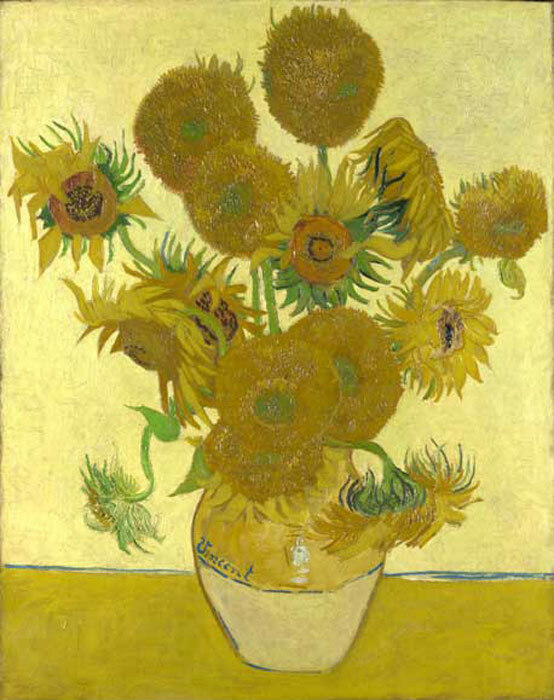 The various versions and replicas of the Sunflowers remain much debated among Van Gogh scholars. SPECIAL NOTE : The painter will make the reproduction as close to the original oil painting as possible. If you want your painting to alter from this likeness, please email us and " Sunflowers, 1888 " will be reproduced according to your special requirements.